The final round of the 2016 RHPK Championship and what a ride it’s been so far. Teams were looking to secure their place in the standings and most were looking to take vital points off of their rivals. In Super, JRH Racing & ITS Racing were level on points, Focus Racing & Team JAM were both in striking distance. In Clubman, Polish Lambo, Team CET, Silverline Racing, KA Racing & NMA Racing were all separated by just 5 points! This month we were joined by a number of new teams. The very successful Titan Motorsport who race at EPS, RPM Racing were in force with two karts headed up by RPM main man Roger Pitchford and March Racing joined their first race with RHPK as a practice for the 2017 Season. With a number of new teams and a couple of regulars back – Artifex & ITS Racing the grid looked very promising for the last round of the season. 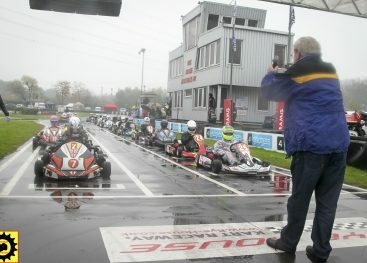 In the week leading up to the race, It was confirmed on the day that we would have an incredible 31 karts on the grid. A big thank you to everyone who entered – a record in November for RHPK. What Are Midgets? Don’t be fooled by the word Midget because there is nothing inferior about these racers. The cars are single seaters using independent wishbone suspension, racing tyres and highly tuned engines to a capacity of 1427cc. Cars may be either front or rear engine, but the overall length of the car is restricted to just 130″, the wheelbase to 82″ and the track width to 66″ – hence the name Midget. 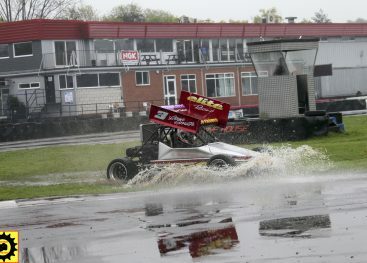 Leon attempted to put a couple of laps of the water logged Ryehouse track before the start of the race. His car, which is setup for left handed ovals proved to be a handful with its very limited turning circle resulting in some off track action! 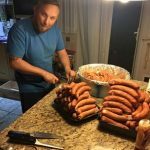 This month the Saturday Sausage fest was sponsored by our new team, March Racing. 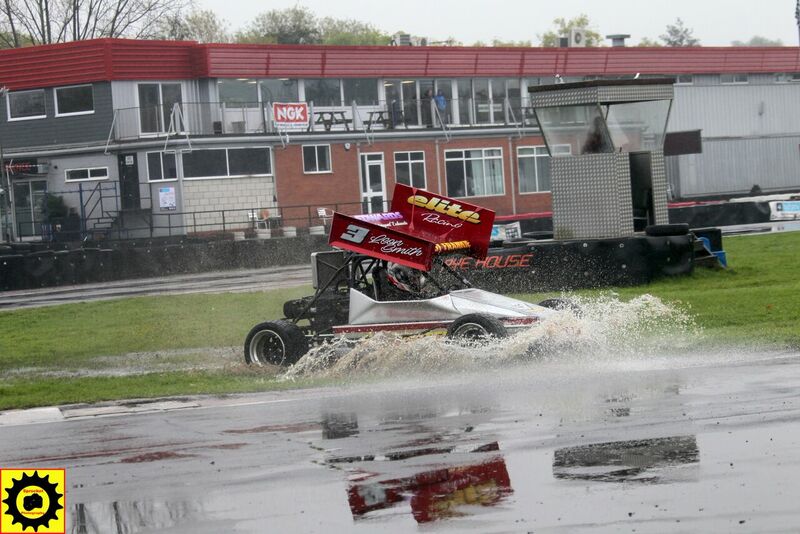 A real tribute to their team spirit in their first race with RHPK. Once again, Team Polish Lambo cooked up lunch for all teams. 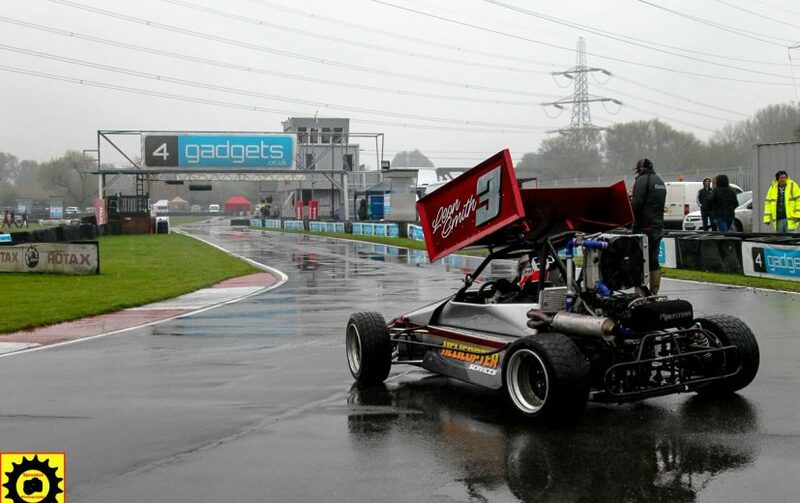 Due to the early race start this month Qualifying got underway at 11:30 on a very wet track. 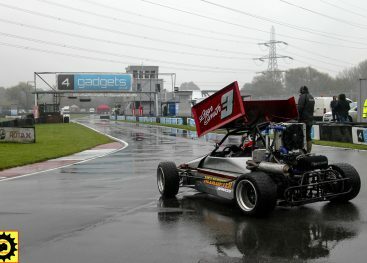 The wet conditions looked to stay with us all day. It was Custom Rods who put in the pole position time of 50.543 towards the end of the session. Just a tenth behind was the mighty quick RPM Racing 1 and rounding up the top three in Super was the second RPM Racing 2 team with a laptime of 50.819. 2016 Season winners Helicopter Services settled for 6th place on the grid. New comers Titan Motorsport were on the second row of the grid in 4th. A very strong performance from Kiss my Hasse racing in 8th place. In Clubman it was the 2016 Clubman winners Team Amigos on the top spot with a laptime of 51.689, mixing it with the Supers! (7th overall) The reformed Team Eyrie Also who have really stepped up their pace towards the end of the season takes 2nd with a lap time of 52.016. Third on the clubman grid was newcomers, March Racing! A fantastic result for them in their first qualifying session! 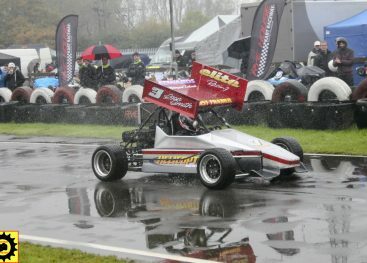 Clubman wet weather pros, Silverline Racing just missed out on 3rd with a time of 52.682. This month the three Tom’s from Team Karting Magazine qualified a very respectable 10th place. 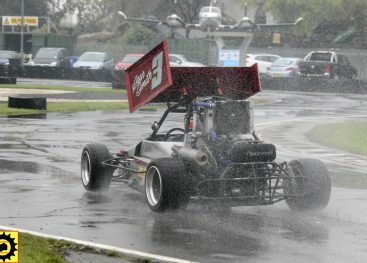 The team getting the kart setup for the wet weather this month. 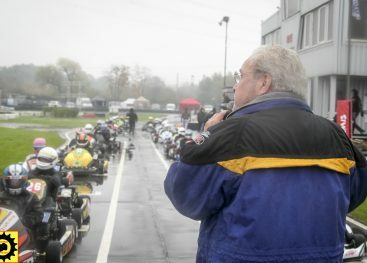 As the green flag dropped 31 karts poured into Stadium, After Stadium RPM 1 & 2 Emerged 1st and second closely hounded by Custom Rods, Titan and ABA Racing. RHPK 2016 Championship winners, Helicopter Services had a coming together with Kiss My Hasse at Pylon which put them down to 14th place by the first lap. After lap one, Clubman Championship Winners, Amigos are leading clubman and in the thick of Super plates with being 8th overall! March Racing in their first race were 2nd in clubman, mighty impressive considering this is the guys first race in RHPK. Biggest mover on lap one is Burton Power Racing taking 6 places on the first lap! At the front RPM Racing 2 start pulling out a lead – Austin Munday clearly over a second quicker during the few laps of the race. Lap 8, Custom Rods in 3rd have to avoid a collision by going off track ABA and Titan Motorsport make the most of this taking both Custom Rods and RPM Racing 1. 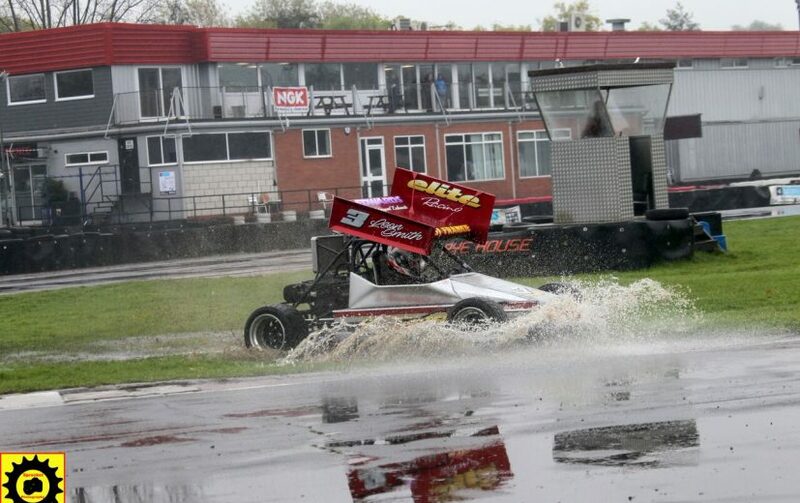 Lap 22, disaster strikes for ABA Racing who suffer engine problems due to the water logged track. Such a shame for the team who were running 2nd and shown so much pace in the early laps of the race. Lap 30 and Custom Rods take Titan Motorsport for 3rd place in a fantastic scrap! 5 laps later Titan would take it back. By lap 60, Silverline Racing are on a charge from their Class 4th place on the grid, they are currently placed 2nd but a very quick Team Eyrie Also are less than a second behind. By lap 67 they take Silverline for Clubman 2nd and start to pull a gap. 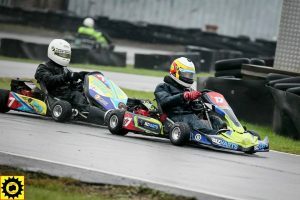 Team Karting Magazine were looking strong as the race progressed, moving up to 8th – however disaster struck for the team as the front left stubaxle sheared off meaning a unscheduled pit stop to replace the sub axle, losing them over 15 minutes dropping them down to 26th place. They drove hard to bring the kart home in 19th. 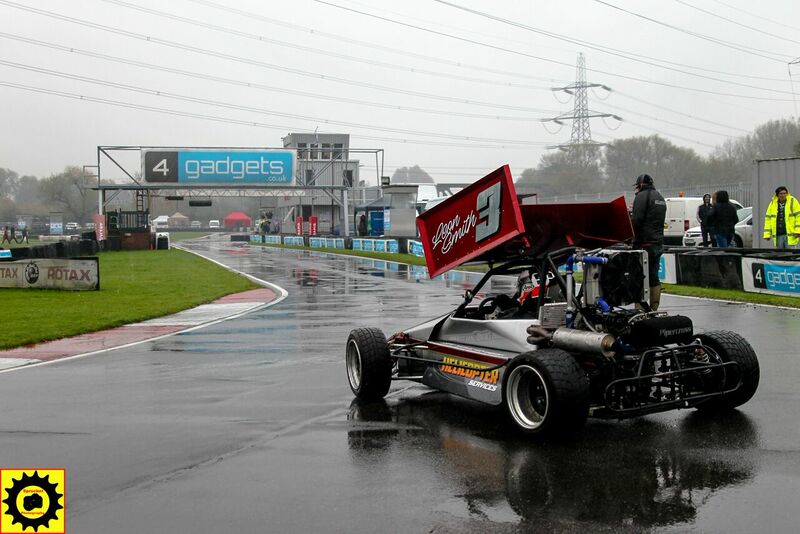 A significantly improved wet setup from the team this round thanks to the work the team have put in with Biz Karts. In the 15 minutes of the race it was clear that ITS Racing were catching JRH Racing, both teams were on the same points going into this round – whoever finished in front would take 4th place in the Championship! As the clock displayed 10 minutes left, just 6 seconds separated both teams. 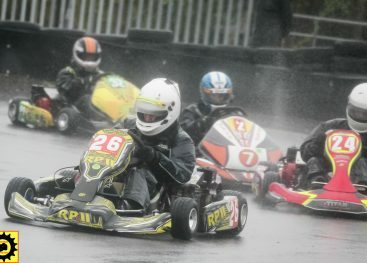 It was going to be close but no one had idea how close it would be until the last lap where the team were ITS was on the bumper of JRH’s kart! JRH blocked and drove a tight line into Pylon and remained tight for the last corner where ITS tried to make a move but ran out of room – In true sportsmanship, ITS Racing‘s Mark Palmer gave the place back and finished less than 0.02 seconds behind settling for 5th in the Championship. As the chequered flag dropped it was a RPM Racing 1 & 2 first and second – a real tribute to the drivers who drove a flawless race in some very tricky conditions. Titan Motorsport took the 3rd spot on the grid after a very strong drive from them in their first race of RHPK. Missing from the top 5 was Custom Rods who had an engine go down on them in the last hour of the race forcing them to retire. Team Lambo were back on form this round by taking the last spot on the podium with a 5th place. In Clubman, Team Amigos took the top spot and 6th overall – a true indication of their Super pace for the 2017 Season! 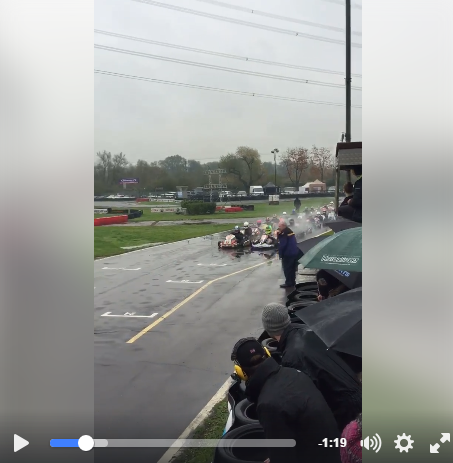 JAB Racing took second place and Silverline Racing take a fantastic 3rd spot on the podium, showing the Clubman grid they are not to be messed with in the wet weather! A notable mention goes to Pelam Racing who took 5th place and the last spot on the podium – a superb result for the team to finish of the season.